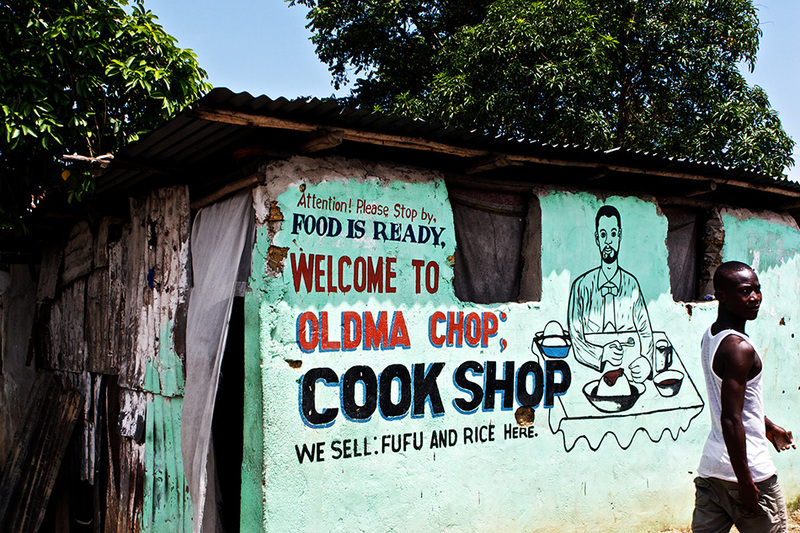 Cook Shops are a Liberian institution, a fine place to get a cheap and tasty meal. I love the rich green colour and wall painting of this one in Monrovia’s St Paul Community, a place I often used to pass on the way to nearby Marlin Corner. Inside the building you would probably be served something like Potato Greens, Goat Stew, or Jollof Rice. The photographer finds the former dish incredibly calorific, and once didn’t need to eat again for another 36 hours. Rice is the staple of choice for most Liberians, people will tell you “if you haven’t eaten rice, you’ve not eaten”. Fufu, is a common alternative, a starchy paste made from root vegetables (such as cassava) and processed in several different ways to produce different consistencies. The ubiquitous accompaniment to any of the above is ‘Pepper Sauce’, impress your Liberian friends with your ability to tolerate this ludicrously hot dish, prepared from unseeded ‘Scotch Bonnet’ chillies – be careful, that’s 200,000-300,000 Scoville Units!